It doesn’t get much better than this. 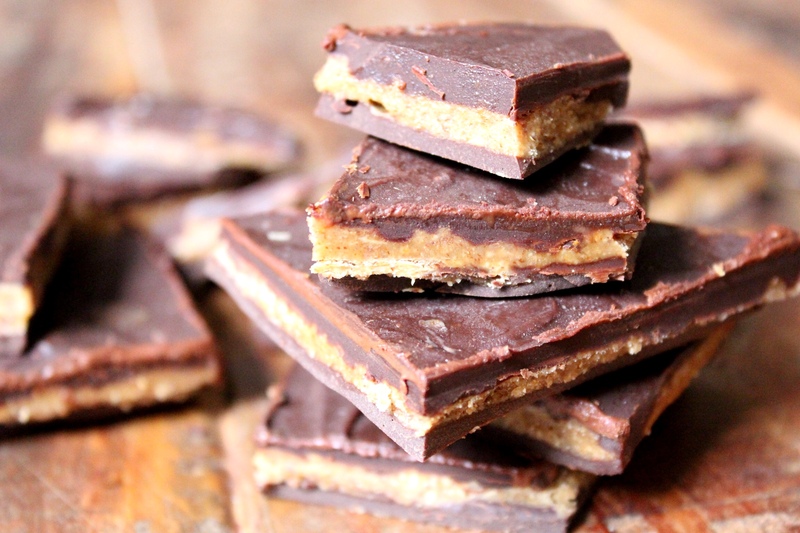 Just a few ingredients are needed to make the most satisfying of treats; a sweet, creamy almond butter filling sandwiched between two layers of rich, dark chocolate. 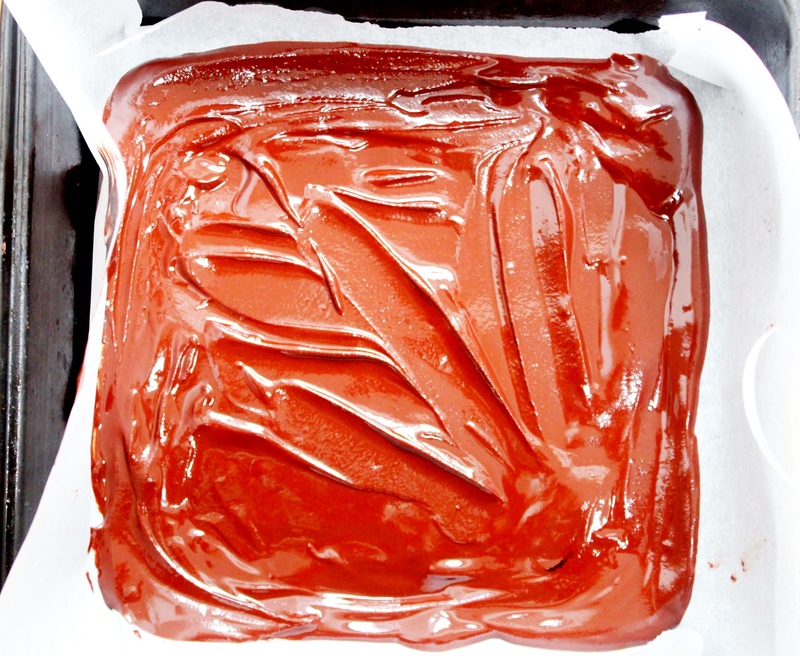 If you don’t have the time or ingredients to make the homemade chocolate you can always melt down your favourite dark chocolate and pick up from there. Either way, it tastes as good as it looks! Melt the cacao butter, slowly on low heat. Then stir in your cacao powder and sweetener. When everything is melted together add it to your blender and blitz on high, this will stop it separating as it cools. 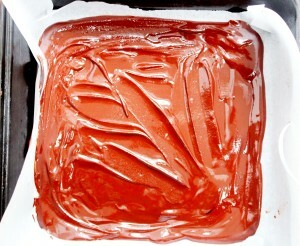 Pour half of it into a baking tin lined with parchment paper and then pop it in the fridge. Leave the other half in the blender. 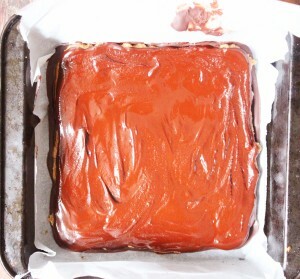 If you are using dark chocolate instead, just melt it slowly and pour half into the baking tin. 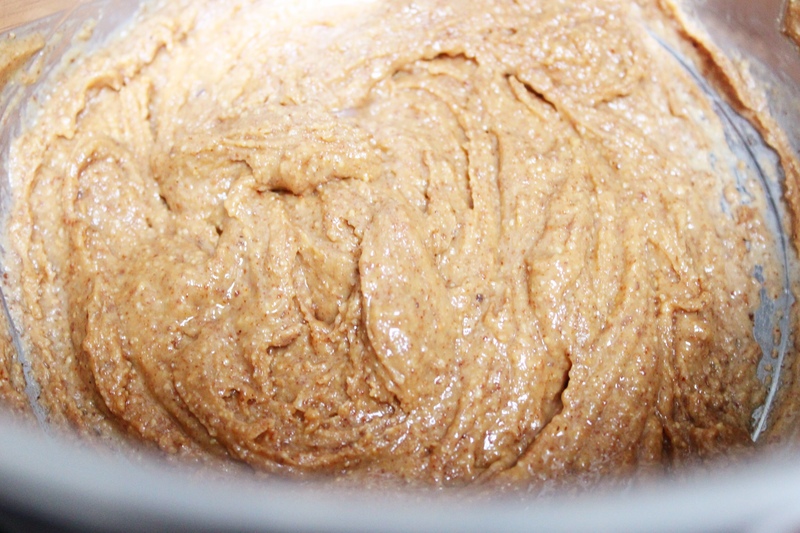 In a sauce pan, melt a tablespoon of coconut oil on medium heat and then add in the almond butter and 2 tablespoons of sweetener, whisking well and letting it all heat through until you have a runnier mixture. 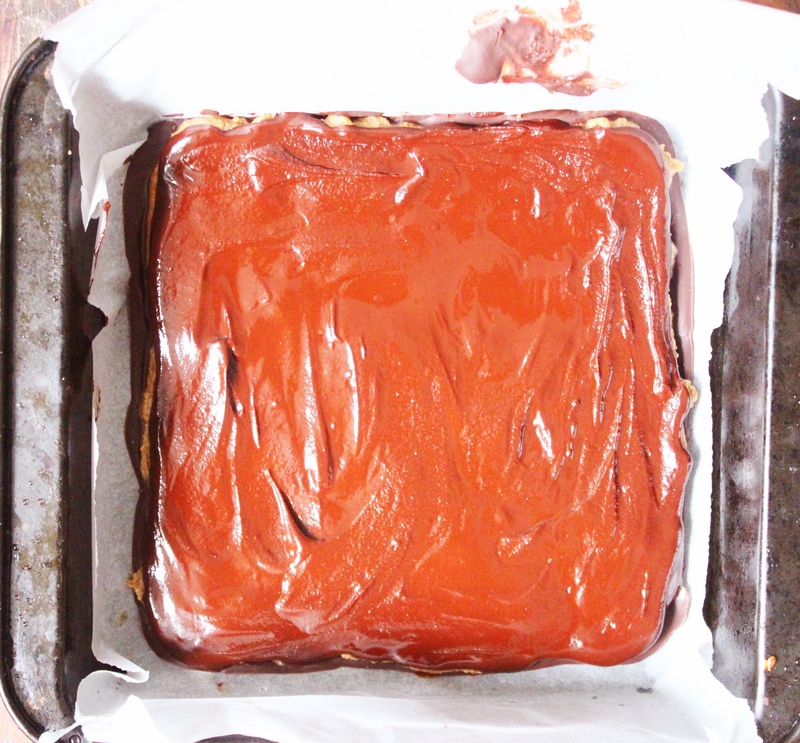 When the first layer of chocolate has hardened, take it out and pour/spread the almond butter filling over it. Let this cool in the fridge for about 10 minutes. Blitz the remaining chocolate mixture in the blender once more, then pour it over the top (if using dark chocolate you may need to reheat a little if it’s cooled too much), tilting the tin to spread it out evenly. 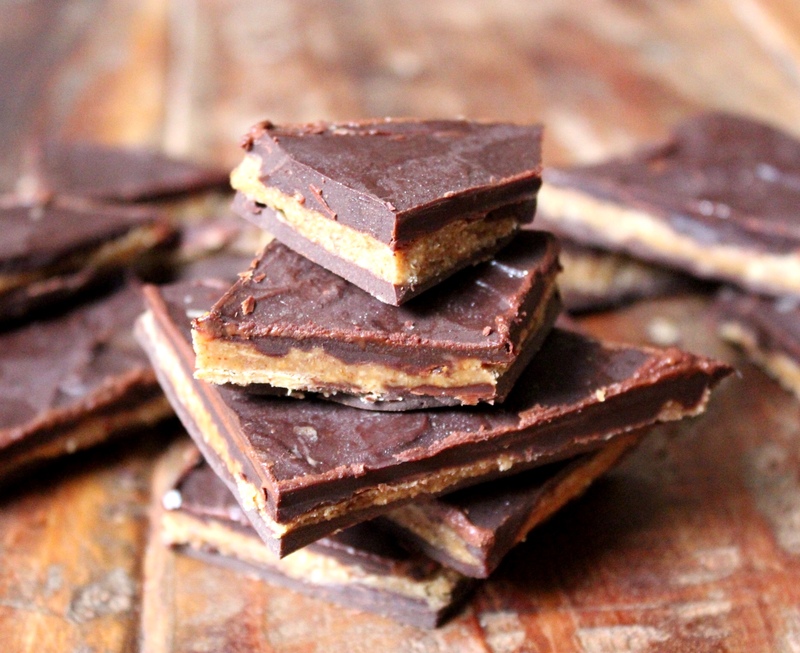 Pop the whole thing in the fridge until hard and then chop into squares or chunks and serve. 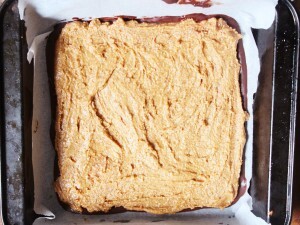 I love the look of the recipes and would love to bake more vegan but the ingredients are so hard to find and very expensive for a student budget. I would really love a section of your web page that covered where to buy coconut oil or cacao butter etc and at decent prices. Yum! Looks so good. 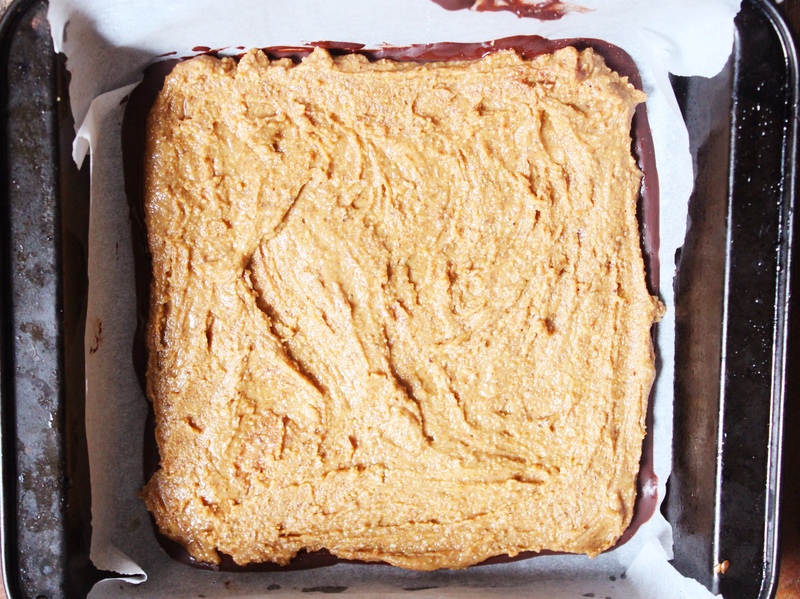 It’s like a flat (and healthier) peanut butter cup. Will try this for my son who has a peanut allergy. I just made these today, but my chocolate mixture looked very different to yours, very watery, 200g seemed like a lot of butter, they taste very oily. I don’t know what I did wrong! Hi, this recipe looks fab! Going to make it tomorrow for a vegan friend & im wondering when you say you can substitute for shop bought chocolate instead of making that part of the mixture yourself, do I add any of the “for the chocolate” ingredients into my shop bought vegan chocolate? Sorry, I know that’s probably a stupid question!